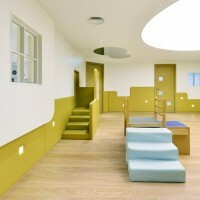 Joey Ho has designed the SPRING early childhood learning centre in Hong Kong. Spring is a newly established learning centre for children that eschews the fairytale cliche of its genre: space filled rainbow colours, cartoon characters, toys and stuff, which is often the result of superimposing an adult’s perspective onto the space. For this project, the designer tried to look at the picture from a child’s viewpoint, and concentrate on the learning experience as a whole. The aim is to formulate a space that caters to children’s both physical and psychological needs, and ultimately help them achieve their development and learning potential. Located in Wanchai, Spring spans across an expansive 7,500 square foot of space. 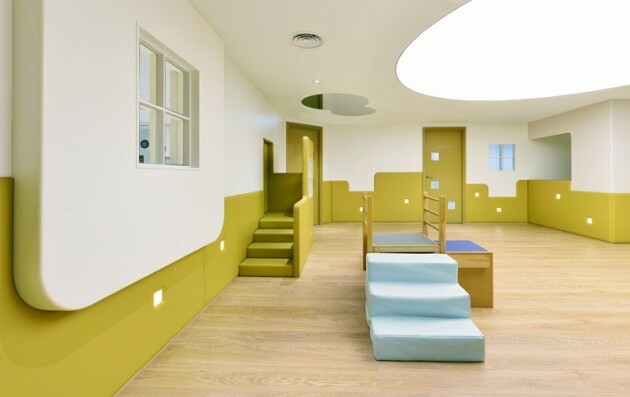 The centre is designed in dual perspective – by bringing together the perspectives of a child and an adult. The idea is to create a space that can be enjoyed by both generation. While the kids are exploring the space, we want adults to take part in the learning process as well, and try to view the world from a child’s point of view. In the end, it is hoped to facilitate a dialogue and interaction between the children, parents and educators. One of the key concepts is that, the centre is to be shared by both children and adults on a fair basis. Hence, two respective furniture systems catering to their ergonomic needs have been designed and placed together in the various functional spaces. For example, the reception counter is fitted with a small staircase to allow kids to climb up and communicate with the staff directly. Instead of having the school logo on the wall, it is carved onto the ceiling, with the letter “n” dropped purposefully from above. As “n” means infinity in mathematics, it bears the meaning of unleashing the infinite creativity in children. The bathroom features a dual height washbasin in the form of a giant fountain. It give kids more fun washing hands and most importantly, it allows adults and children to share the same facility together. The designer also added a little “adult” touch to the facilities throughout the centre. In the multipurpose stadium, the basketball court lines is engraved onto the ceiling as LED lighting which produces an interesting and illusionary effect. Yet, audience bench seating and folding wall panels make it a flexible and functional space to accommodate a variety of activities such as seminars, forums or exhibitions. 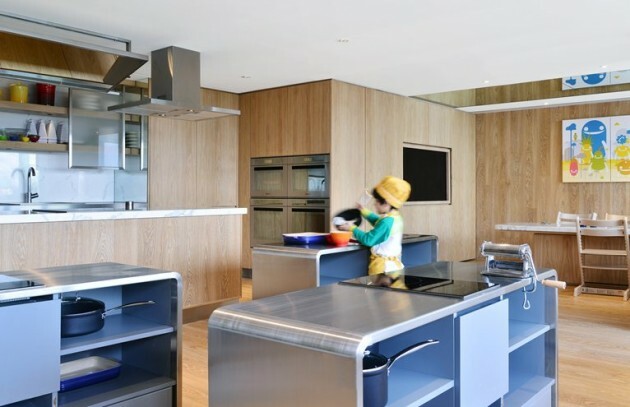 The cooking studio is modeled after a professional kitchen, equipped with stainless steel worktops and kitchen equipment which are reduced to child dimensions to give about an authentic cooking experience. Likewise, the Kindyroo & activity rooms is designed as a miniature of our city, with colorful graphics mimicking the cityscape decorating all the walls and doors. All of these “adult” contexts are re-interpreted and executed in a way that can be easily comprehended by children. Throughout the centre, fairytale cliches have given way to a neutral palette of white, light green, pastel blue and wood. However, there is no lack of playful details that remind us of our happy childhood memories. For instance, the cafe area is literally a children’s wonderland. Inspired by the lush greenery outside, three little pods in the form of hillocks create cozy cocoon perfect for reading or internet surfing. Another focal points are also two “tree houses” and swings to fulfill everyone’s wildest childhood dreams. Functional and inspirational at the same time, these pieces are not just furniture sitting idly around, but are toys that invite the kids to play, explore and interact. And they are both child and adult friendly, which is the core design concept behind the whole project.